Doesn’t this look like a beautiful sim? Don’t you just want to go there and relax? Well, guess what? It’s not a sim. It’s a new gorgeous sky area from Belle Belle! The new Calypso’s Cave is truly a marvel. At around 260 prims, it’s the perfect little secret getaway. And of course it is equipped with the Belle Belle Passion Inside animation system, so there are lots of cuddles, kisses, and….well, you know. 😉 But more than that, it’s just PRETTY! The stunning waterfall, the gorgeous “sunlight” streaming through a hole in the cave, little fish swimming serenely in the water, and pretty little fireflies lighting up the cave – well, gosh, what is NOT to like? 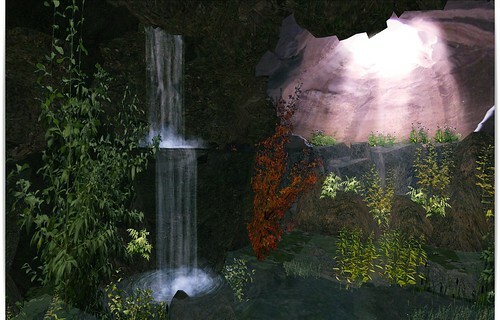 Calypso’s Cave also comes with the “Bliss Box” feature. You rez out a cute little cloud, set your desired height, and whoosh! You’re off and then it all rezzes out for you. It’s so very simple!! If you choose not to leave the cave up, you just call for your cloud again, and you’re safely delivered back to the ground, and everything de-rezzes. There is also an optional grotto entrance, in case you feel like just leaving it up, and the entrance acts as a teleporter to get you back where you want to go. It’s wonderful! 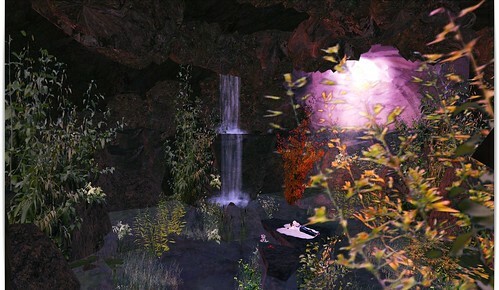 I’ve always enjoyed Leyla’s work, but I have to say – Calypso’s Cave may be the build that has impressed me the most. Get to Belle Belle and pick yours up! You won’t be sorry! They say that turquoise is a protective stone. It’s also said to draw out negativity, stabilize your mood, and eliminate nervousness and fears. That alone would get me to wear it [I admit to totally being into crystals and stuff like that], but the fact that it’s just pretty makes it even more worth it! And the new Kalya set in blue from ByKay is just lovely, and most definitely drew out any negativity I had going, because who could be in a bad mood with jewelry this pretty? I’m not always a big fan of big chunky jewelry, but this is so so pretty, I just don’t want to take it off. The big beads, the stacked rings, the gorgeous earrings… Oh, you just have to see it on yourself. It’s wonderful! Kalya also comes in green and olive, and there are also prim nails with the rings as well. Head over to ByKay and buy buy buy!! Sometimes when I’m browsing XStreet, I’ll see something and think, “Oh! That is pretty! But where would I ever wear it?” The Wonderland dress by Salt was one of those things. So pretty, but not exactly my normal style, so I figured I’d never wear it. Last night I was browsing over at D!va hair when I decided to take a walk around the sim. Gorgeous!! Simply gorgeous! Then the thought popped into my head. The Wonderland dress would look great here! After all, can you really explore a sim without being properly dressed? I don’t think so! A recreation of the dress from the “Alice” movie, this dress is just so elegantly pretty. Creator Tammany Goodliffe hand drew the bodice, lace and skirt embroidery based off of photos. Look at the hem – just adorable! The Wonderland dress also includes striped handwarmers [not shown] and vintage Victorian style boots, which you cannot see because of the angle of the photo. If you buy this dress, and really you should, I suggest buying it from the XStreet page because it is $100L cheaper! But do check out the other goodies at Salt because there’s lots of pretties! Oh, and like I said, I was on the sim where D!va is when I took this picture, so of course I had to buy this cute Natsumi hair. The only thing I was not really fond of at D!va is that the hairs are no modify, and come with the resizer script. I much prefer being able to grab a prim and drag or stretch it to where I need it. But hey, if you buy hair that covers your ears, it’s not always a problem! I’m off to go find a white rabbit to chase and who knows, maybe I can find a drink to shrink me. Oh, wouldn’t that be nice?? Every time Ashoka Eales of Phoenix Rising pops up in my IM box, I always know something fabulous is about to happen. I certainly wasn’t disappointed! All the new pretties at Phoenix Rising…I hardly knew what to wear! But somehow, I was just called to the green today, although it is not normally a color that I wear. The Intake shirt in Grass is the perfect icy green color. In fact, it should have been called Mojito, because that’s what I thought of when I put it on. Mmmm…ice cold mojitos… Oh, sorry. The Intake shirt almost looks like it should be an undergarment, but with the addition of the big flouncy ribbon, why would you even think about covering it up? Now, I am forever on the search for good shorts in SL, and these new Tegan shorts, which I am wearing in Forest, fit the bill perfectly! Not too short, not too long, and with exceptional texturing. I just love them! There are lots of other new goodies at Phoenix Rising, which I’m sure will be making their way into my blog soon. But do yourself a huge favor and head to the store to check them out! A few days ago when Delora Starbrook of Haven Designs released her new Picnic Sundress, my friend Isle said that the dress “had Ali written all over it.” How could I possibly resist that? So so cute! I love the cute little floral print, and just how casually pretty it is. The Picnic Sundress comes in 7 different colors and if you hurry, I believe the limited edition blue one for Stumblebum may still be available. Scoot down to Haven Designs and pick this up!